In archaeology, timber circles are circular arrangements of wooden posts interpreted as being either complexes of freestanding totem poles or as the supports for large circular buildings. Timber circles in the British Isles date to the late Neolithic and early Bronze Age. The posts themselves have long since disappeared and the sites are identified from the circles of postholes that they stood in. Aerial photography and geophysical survey have led to the discovery of increasing numbers of the features. Often a postpipe survives in the posthole fill aiding diagnosis. They are usually more than 20 metres (66 ft), and up to 60 metres (200 ft), in diameter and the posts that constituted them were generally more than 50 centimetres (20 in) wide. Technically, they always consist of at least two concentric circles or ovals of timbers although there are variations on the rule such as the monuments of Seahenge and Arminghall, both in East Anglia which are often described as being timber circles. Wider gaps between the posts are thought to have served as entrance routes. The builders replaced the posts as they decomposed and in some cases stone circles were adopted instead during later phases. They appear either alone or in the context of other monuments, namely henges, such as that at Woodhenge and henge enclosures such as those at Durrington Walls. The only excavated examples of timber circles that stood alone from other features are Seahenge and Arminghall in Norfolk and the early phases of The Sanctuary in Wiltshire. They probably served ritual purposes. Animal bone and domestic waste found at many timber circle sites implies some form of temporary habitation and seasonal feasting. They were built on high ground and would have been very conspicuous. Isolated burials have been found at some sites but not enough to suggest a strong funerary purpose. Timber circles have a long history among Native American societies; their use stretches back for thousands of years and continues into the present day. From the 3400 year old Archaic period Poverty Point site in Louisiana to 2000 year old Hopewell tradition circles found in Ohio to the Sun Dance performed in wooden pole "corrals" by the Dhegihan-Siouan and Caddoan speaking peoples of the Great Plains. 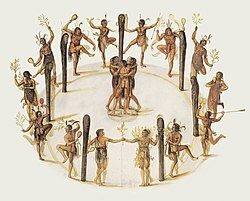 An early example of a timber circle witnessed by Europeans was recorded by watercolor artist John White in July 1585 when he visited the Algonquian village of Secotan in North Carolina. White was the artist-illustrator and mapmaker for the Roanoke Colony expedition sent by Sir Walter Raleigh to begin the first attempts at British colonization of the Americas. White's works represent the sole-surviving visual record of the native inhabitants of the Americas as encountered by England's first colonizers on the Atlantic seaboard. Whites watercolor and the writings of the chronicler who accompanied him, Thomas Harriot, describes a great religious festival, possibly the Green Corn ceremony, with participants holding a ceremonial dance at a timber circle. The posts of the circle were carved with faces. Harriot noted that many of the participants had come from surrounding villages and that "every man attyred in the most strange fashion they can devise havinge certayne marks on the backs to declare of what place they bee." and that "Three of the fayrest Virgins" danced around a central post at the center of the timber circle. The oldest known timber circles in North American archaeology were found at Poverty Point in 2009 by archaeologists from the University of Louisiana at Monroe and Mississippi State University, led by Poverty Point station archaeologist Dr. Diana Greenlee. They discovered evidence in the 37.5 acres (15.2 ha) plaza area for multiple wooden post circular structures ranging from 82 feet (25 m) to 206 feet (63 m) in diameter; built during the earliest habitation of the site circa 2400 BCE. The site now has a ring of concrete posts marking the position of one of the circles. Other examples have been found at Hopewell culture sites in Ohio. Moorehead Circle was constructed about two millennia ago at the Fort Ancient Earthworks. It was discovered in 2005 by Jarrod Burks during magnetic surveys at the large hilltop enclosure near Lebanon, Ohio. The site consists of three concentric circles; with the outer circle being about 60 metres (200 ft) in diameter. Robert Riordan, Professor of Archaeology at Wright State University and lead archaeologist investigating the site, estimates that about two hundred wooden 10 feet (3.0 m) to 15 feet (4.6 m) tall posts were set in the outer circle. According to radiocarbon dates performed on charcoal found at the site, it was built between 40 BCE and 130 CE, with other charcoal fragments from burnt posts dating to 250 to 420 CE, suggesting the circle was in use for several centuries. In September 2005 archaeologist Frank Cowan conducted excavations at the smaller circular enclosure at the Stubbs Earthworks in Warren County, Ohio; discovering a timber circle 240 feet (73 m) in diameter and composed of 172 large posts. Carbon dating of charcoal found in post molds at the site have dated the structure to 200-300 CE. The existence of the series of woodhenges at Cahokia was discovered during salvage archaeology undertaken by Dr. Warren Wittry in the early 1960s in preparation for a proposed highway interchange. Although the majority of the site contained village house features; a number of unusually shaped large post holes were also discovered. They formed a series of arcs of evenly spaced posts. Wittry hypothesized that the arcs could be whole circles and that the site was possibly a calendar for tracking solar events such as solstice and equinoxes. He began referring to the circles as "woodhenges"; comparing the structures to ones found in England. Additional excavations found evidence for five timber circles in the general vicinity, now designated Woodhenges I through V in Roman numerals. Each was a different diameter and had a different number of posts. Because four of the circles overlap each other it is thought they were built in a sequence, with each iteration generally being larger and containing 12 more posts than its predecessor. A full sequence for what has become known as Woodhenge III was found (except for nine posts on the western edge that had been lost to dump trucks for road construction fill) and a reconstruction of the circle was built in 1985; with the posts being placed into the original excavated post positions. The Illinois State Park system oversees the Cahokia site and hosts public sunrise observations at the vernal and autumnal equinoxes and the winter and summer solstices. Out of respect for Native American beliefs these events do not feature ceremonies or rituals of any kind. Archaeologist Marvin Fowler has speculated that the woodhenges also served as “aligners” and that there may have been as many as 3 more in other strategic locations around the city of Cahokia, built to triangulate and lay out construction projects. At least one other possible circle at Cahokia has been put forward by Fowler, but his suggestion has not yet gained full acceptance by other archaeologists. This location was discovered near Mounds 72 and 96, directly to the south of Monks Mound. Several post holes of what may have been a ceremonial area with a 412 feet (126 m) in diameter circle and 48 posts. Archaeologists have dated the placement of at least one of the posts to approximately 950 CE. Archaeological research has shown that four of the posts were at the cardinal locations of north, south, east and west, with eastern and western posts marking the position of the equinox sunrise and sunsets. Four other posts in the circle were shown to be at the summer solstice sunrise and sunset and the winter solstice sunrise and sunset positions. This setup is nearly identical to the diameter and post positions of Woodhenge III, differing only in that Woodhenge III was 2 feet (0.61 m) smaller in diameter. 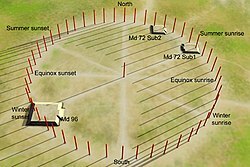 The placement of the two mounds at the location and the directions in which they are oriented correspond to several of the solstice marking posts. The post nearest the later elite burial of the "Birdman" is the location that marked the summer solstice sunrise at the times of the sites use. The early stages of the mounds were actually constructed around the posts, although at a later point the posts were removed. ^ Timothy R., Pauketat (2009). "High Plains Drifting". 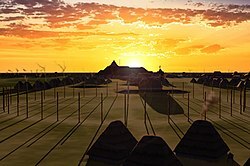 Cahokia : Ancient Americas Great City on the Mississippi. Viking Press. ISBN 978-0-670-02090-4. ^ Daniels, Dennis F. "John White". NCpedia. Retrieved 2017-12-19. ^ Tucker, Abigal (December 2008). "Sketching the Earliest Views of the New World". Smithsonian Magazine. Retrieved 2017-12-19. ^ "A Selection of John White's Watercolors : A festive dance". Encyclopedia Virginia. Retrieved 2017-12-19. ^ Gilmore, Zackary I.; O'Donoughue, Jason M., eds. (2015). The Archaeology of Events: Cultural Change and Continuity in the Pre-Columbian Southeast. University of Alabama Press. p. 149. ISBN 978-0817318505. ^ "Poverty Point : Plaza". Louisiana Division of Archaeology. Retrieved 2017-12-20. ^ Greenlee, Diana. "Poverty Point". Louisiana Endowment for the Humanities. Retrieved 2017-12-20. ^ Miller, Gregory L. (2010). Ohio Hopewell Ceremonial Bladelet Use at the Moorehead Circle, Fort Ancient (Masters) (Thesis). Ohio State University. ^ "The Robert L. Harness Lecture Series on Ohio Archeology Summer Lecture Series 2008" (PDF). Retrieved 2017-12-19. ^ Lepper, Bradley T. (2007-05-01). "'Woodhenge' at Fort Ancient raises interest in ritual past". Retrieved 2017-12-20. ^ Cowan, Frank (2005). "Stubbs Earthworks : An Ohio Hopewell "Woodhenge"". In Lepper, Bradley T. (ed.). Ohio Archaeology : An illustrated chronicle of Ohio's Ancient American Indian Cultures. Wilmington, Ohio: Orange Frazer Press. pp. 148–151. ISBN 978-1882203390. ^ Wittry, Warren L. (1964). "An American Woodhenge". Cranbrook Institute of Science Newsletter. 33 (9): 102–107 – via Explorations into Cahokia Archaeology, Bulletin 7, Illinois Archaeological Survey, 1969. ^ Wittry, Warren L. "Discovering and Interpreting the Cahokia Woodhenges". The Wisconsin Archaeologist. 77 (3/4): 26–35. ^ a b c Iseminger, William R. "The Skywatchers of Cahokia". Mexicolore. Retrieved 2017-12-19. ^ Iseminger, William. "Welcome the Fall Equinox at Cahokia Mounds". Illinois Department of Natural Resources. Retrieved 2017-12-20. ^ "Winter Solstice Sunrise Observance at Cahokia Mounds". Collinsville Chamber of Commerce. Retrieved 2017-12-20. ^ "Cahokia Mounds Mark Spring Equinox : The keepers of Cahokia Mounds will host a spring gathering to celebrate the vernal equinox". Indian Country Today. Indian Country Media Network. Retrieved 2017-12-20. ^ a b c Young & Fowler (2000). "Woodhenges revisited". Cahokia: The Great Native American Metropolis. pp. 216–243. ^ "Mound 72". UW-Milwaukee Archaeological Laboratory. Retrieved 2017-12-19. ^ "Cahokia Layout". Illinois State Museum. Retrieved 2017-12-19. Wikimedia Commons has media related to Wood henges.